Powis Castle01938 551944work CastlePerched high on a rock above the world-famous garden terraces, Powis Castle, originally built circa 1200, began life as the medieval fortress of the Welsh Princes of Powys, who held onto their kingdom despite the threats of their more powerful neighbours in Gwynedd and England. In 1587, Powis Castle was sold to Sir Edward Herbert who created the romantic long gallery, which is richly decorated with the coats of arms of his ancestors. 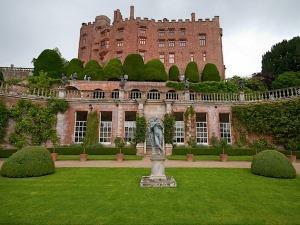 In 1784, the marriage of Lady Henrietta Herbert and Edward Clive, son of Robert Clive, the conqueror of India, combined the Powis and Clive estates. Today, the medieval Castle contains one of the finest collections of paintings and furniture in Wales. It was originally built by Welsh Princes and was then the ancestral home of the Herberts and Clives. The beautiful collection of treasures from India is displayed in the Clive Museum. The Castle & Gardens have been remodelled and embellished over more than 400 years and reflect the changing needs and ambitions of the Herbert family - each generation adding to the magnificent collection of paintings, sculpture, furniture and tapestries. In the early 20th Century, the 4th Earl of Powis and his wife, Lady Violet, redecorated much of the castle and brought the garden back to life, introducing new varieties from all over the world. Perched high on a rock above the world-famous garden terraces, Powis Castle, originally built circa 1200, began life as the medieval fortress of the Welsh Princes of Powys, who held onto their kingdom despite the threats of their more powerful neighbours in Gwynedd and England. The world-famous garden, overhung with clipped yews, shelters rare and tender plants is laid out under the influence of Italian and French styles. It retains its original lead statues and an orangery on the terraces. See website for opening times.